Tips For Moving In With Your S.O. 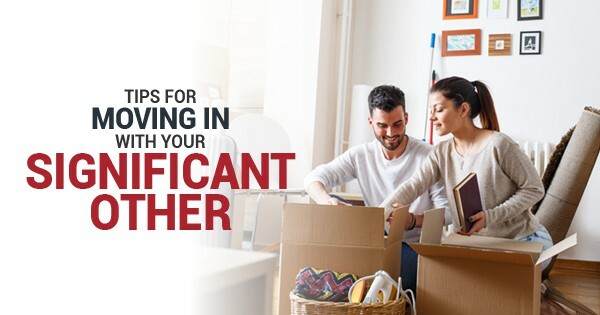 Moving in with your significant other is a big, exciting step in any relationship, but like anything worth doing, it can be difficult. You have all your stuff, your S.O. has all of their stuff, and you’re trying to navigate everything across town. Don’t sweat it — take a deep breath and follow some simple tips, and you’ll be ready when the moving service arrives at the door. If you can’t give up your grandma’s giant upholstered desk chair but there’s just no room for it in your girlfriend’s apartment, then invest in a self-storage situation until you and your S.O. upgrade to a bigger space. The good news is that Portland isn’t even in the top five cities with expensive storage in the nation (that would be San Francisco, Los Angeles, San Jose, New York, and San Diego). Also, you won’t agree on every style choice. Compromise is key. For a smaller local move, sticking with local movers give you access to people who live nearby, know the area well, and whose storefront is easy to access, making problem-solving on moving day a breeze. Added bonus: choosing local movers in Portland means supporting small businesses who are also your neighbors! Maybe you absolutely NEED an hour of quiet to listen to classical music and NPR at the end of the day. We all have quirks and rituals. Communicate with your S.O. before moving day so you both know what major things to expect that might not have come up while you were living separately. When first moving in together, it can be easy to draw lines by accident like, “this is my couch”, “that’s my gym”, “these are my expensive bath soaks”. Find a totally new activity, coffee shop, or home fixture that you choose together. Even if you do everything “right”, a small move can be just as overwhelming as a cross-country move. Don’t worry if you’re panicking a little while you’re moving boxes around. Professional movers won’t care, and your S.O. will understand. Take the time to enjoy the big step you’re taking, the stress will be done soon.